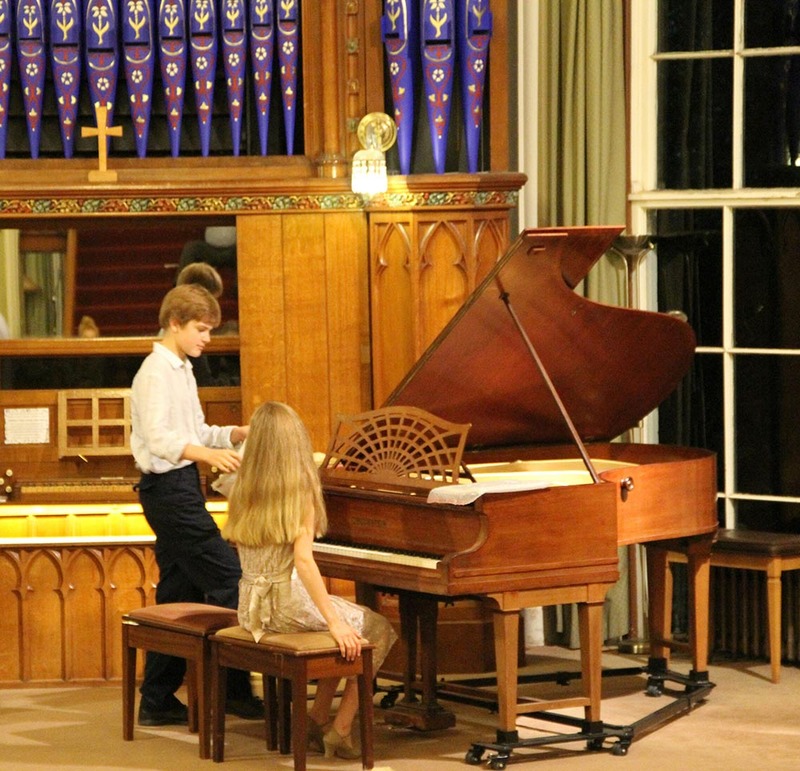 Since the concept and initiation of fundraising for Sidholme’s historic and elegant Music Room, there have been many varied and high quality concerts for all to enjoy. Capacity audiences regularly attend each performance. Musicians, of a high standard, have been given the opportunity to perform in this unique setting, as well as invited professional instrumentalists and vocalists. Local schoolchildren have also been encouraged to share the stage, gaining a rich and memorable experience of performing in a beautiful and purpose-built venue - always to enthusiastic audiences! These regular and popular concerts provide something immensely special to the community, in that they are ‘all-inclusive’. There is no sense of concerts being performed primarily to a select and elite audience. All are welcome ... the audiences coming from many walks of life, valuing the opportunity to enjoy the variety of rich musical experiences and the warm welcome provided on each occasion. I cannot praise highly enough, the inspired concept of involving our enthusiastic local community in such a beneficial way, giving quality concerts for all, whilst fundraising to refurbish a magnificent and historic Music Room. "The Sidholme Music Room is an excellent music venue, perfectly sized for chamber concerts with an excellent acoustic and a piano that is fit for performance - something that is not all that common in East Devon. 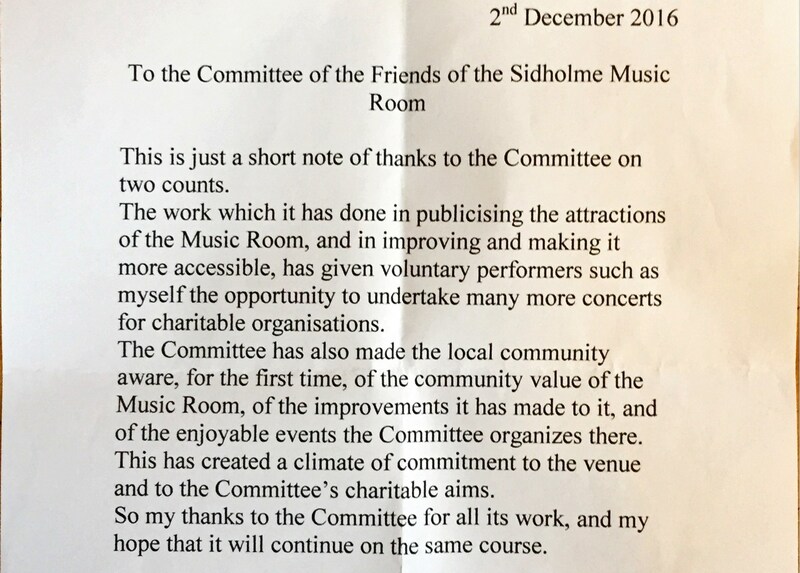 The work that the 'Friends of Sidholme Music Room' are doing to restore the venue is very important, ensuring that high quality music performance can continue in Sidmouth and performers like myself have a beautiful space to play in. The 'Friends' seem to be tireless in their efforts and enthusiasm for the task, and once they have succeeded in restoring the Music Room we will have a space in which we can continue performing for many years to come - and I, for one, will be keen to carry on performing there"
Sidholme in Sidmouth is a unique setting for the performance of music of all genres - classical, modern, folk - suitable for singers and performers of all ages who belong to a spectrum of varied instrumental and vocal ensembles. Performers come from near and far. Concerts frequently take place free of charge in front of capacity audiences who are very appreciative of the enormous energy put in by the Friends of Sidholme as they continue to raise funds to continue a massive restoration programme. The frequency of presentations has increased and the general standard of performances are highly commendable allowing individuals and groups of all ages to offer comprehensive programmes. Events at Sidholme have become a greatly valued resource and much appreciated by the whole community. Music adviser Joanna Leach Foundation.